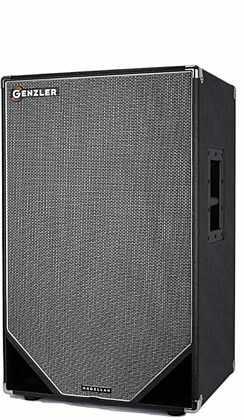 The Genzler MG212T Magellan Bass cabinet design shares a heritage to many previous Jeff Genzler designs. This light-weight cabinet, constructed from 12mm and 15mm Baltic Birch plywood delivers powerful, full-body response with a modern, yet classic styling. The cabinet is wrapped in a heavy-duty black textured vinyl with a complimentary woven wire, silver and black grille cloth and silver metallic piping. The distinctive front triangular ports provide an optimum porting design as well as structural strength in the corners of the cabinet. All of this sets the Magellan series apart from standard black boxes and defines that this is the pinnacle of professional bass amplification equipment. In looks and performance this is a modern take on a classic design. zZounds is an authorized dealer of Genzler Amplification products. - Two: Premium Faital neodymium 12” cast frame loudspeakers utilizing a unique dual-wound voice coil design for increased power handling and efficiency. - One: Proprietary compact 1” bullet tweeter with Ferro Fluid infusion in the voice coil gap for higher power rating and smoother high frequency response. One — Speakon NL-2 connector and 2 – ¼” sealed jacks; to reduce rear cabinet air loss and noise. Metal chrome corners and recessed black metal bar handles.